It has been four months in succession that Ghana Armed Forces has not been paid on the 15th of the month. Ghanaian soldiers are paid on or before the 15th of any month, but since the coming into office this NPP government, this arrangement has been violated with impunity several times, the latest being four months in a row. 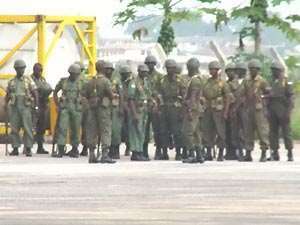 The NPP being too much afraid of the soldiers, increased their salary and allowances over 50%. Now the soldiers are in a state of confusion. Up to the 19th of April their salaries have not been paid. Some are on operations outside the country and had given post dated checks to their spouses who knew that "pay day" is either 14th or 15th of the month. All the checks they presented have been dishonoured. This situation is making the soldiers jiltry. This never happened during the P/NDC regimes. Limann made a similar mistake by increasing the salaries of the Armed Forces by 100%, but he was over throwned by the same soldiers, even in his case the soldiers were paid on time that was when soldiers took pay twice a month.